Late Greenfield resident Alta Smith Dwyer is pictured at age 26. Alta Smith Dwyer did not have easy life in early 1900s Greenfield. But she had been a teacher and was an avid reader, so sometimes, when trying to make ends meet, she wrote “ditties” to promote local companies and products, and earn some extra money, her granddaughter, Leesburg resident Alice Teeters, said. Recently, Teeters came across some of the ditties that her grandmother penned and were printed in the Greenfield Times. The Press Gazette in Hillsboro, Greenfield Daily Times, Lynchburg News and Leesburg Citizen all merged in 1996 to form what today is The Times-Gazette. Teeters said her great-grandmother, Emma Smith, also wrote ditties, and her mother, Delma Fairley, wrote poetry, too. 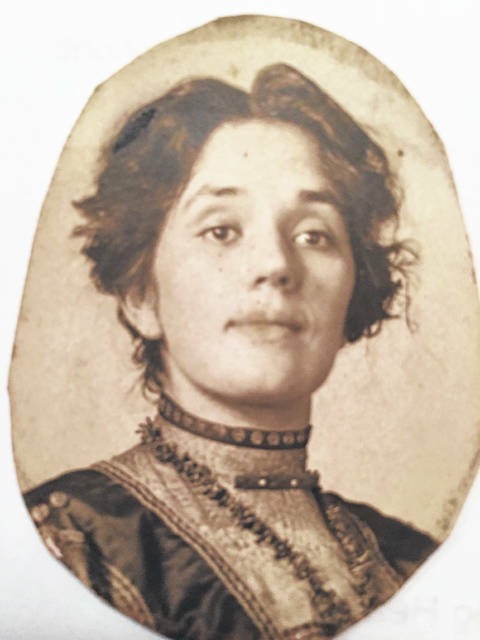 Recently, Teeters provided copies of two of her grandmother’s ditties to The Times-Gazette, one written for the Greenfield Times and another for the Greenfield Furniture Co. owned by L.F. Brizius. She said her grandmother also wrote for a Greenfield coal company and other area businesses. Dwyer was a primary school teacher in Chrisney, Ind. before she moved to Greenfield in 1913 to become the wife of Earl Dwyer. Teeters said that while she is not exactly certain, she believes that one of her grandmother’s cousins knew the Dwyer men from Greenfield and introduced her grandmother to her future husband. Earl Dwyer, Teeters said, was one of five children and the family was likely early pioneers in the Greenfield area since some of them are buried in the Old Burying Ground behind the Travelers Rest in Greenfield. Teeters said her grandfather had a teaching degree, but instead was a log farmer who also dabbled in other employment pursuits. She said he did some threshing in North Dakota, and at other times worked in places like Dayton and Akron, when he would be away from home during the week. When he was gone, he often sent letters home. “I have letters postmarked from Osborn, Ohio, and there is no Osborn,” said Teeters. She said she thinks Osborn may have been around present day Fairborn. Alta and Earl had three children, a son born Feb. 19, 1914, and male and female twins born in August of 1915. But not long after their birth, Teeters said the Spanish flu spread across the country, all three kids got sick, and the oldest child and male twin died in the same week in August of 1916. Then Earl Dwyer died in 1927. After his death, Alta did ironing and took in borders, in addtion to writing ditties. She was also a member of the Greenfield Methodist Church, taught Sunday school, and had a youth group. Alta Dwyer died in 1948, two years before Teeters was born.